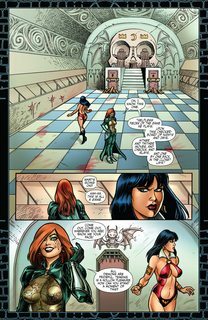 Our story begins when the silver tongued demon Masodik tricks and kidnaps both Dawn and Vampirella. He tells them that they are the 2 most beautiful women in all of the worlds, these two ‘Bad Girls’. Their demon host demands a cat fight to see who is best suited to his purposes, but the ladies suggest something more feminine — a storytelling contest. Together they take us to the bloody shores of Draculon, to post-apocalyptic New York and to worlds beyond imagination. Only Ravana knows what rewards and punishment await the winner and the loser in this duel of horror hostesses.